Amidst the jungle air, the palm trees and the wild animals, even the coldest heart can find jungle love at an African Safari Sweetheart Dance. Create the perfect atmosphere for a dance that attendees will remember for years to come. Bring on the Trees, Please! The key to any successful African Safari Sweetheart Dance is the trees. They do, after all, make up the most important part of the jungle backdrop. Make sure your venue is decked out with palm trees of all shapes and sizes. If the room is tall enough, consider some Tropical Palms that tower six to nine feet into the air. While three-dimensional trees are best, if the budget is super tight, paint palm trees on murals using banner paint. A jungle safari isn’t complete without animals. Venture deep into the jungle with photo image cutouts of a lion, a tiger and a gorilla. But don’t stop there, every jungle needs some monkeys. A Monkey Arch and Tree is a good fit for the entrance to your event. For fun at every table, consider putting children’s toys like stuffed animals as centerpieces or in chairs. If jungle love is what you truly desire at your African Safari Sweetheart Dance, the lighting is very important. What could be more romantic than a sparkling waterfall? Stunning blue water gossamer and twinkle lights are draped down from more than nine feet in the air to make this jungle waterfall, which also works well as a photo backdrop. Since the atmosphere is romantic and lighting will be low, use tube lights to light the walkways from the entrance to the tables, and from the tables to the dance floor. They also work great around three-dimensional palm trees. There’s no shortage of songs about the jungle or Africa. Some of our favorites are Steve Miller Band’s “Jungle Love” and Toto’s “Africa.” Play some of Kool and the Gang’s “Jungle Boogie” for a fun tune that will get everyone on the dance floor. Music is key to making any dance a success, and having a handful of songs to go with the dance theme help make it that much more memorable. The name speaks for itself: the Jungle Allure Kit. There’s no easier way to prepare for an evening of romance in the jungle. Animal standees, grass, palm trees, and more create this must-have set for the dance sponsor who wants to go all out. An African Safari Sweetheart Dance is a fun and romantic way to set the scene for an unforgettable night. With the right decorations and music, it can be the most popular dance of the year. What will you do to make sure your attendees find jungle love at the dance? Lions and tigers and bears? Oh my! 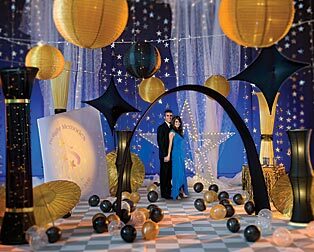 Vicious beasts may not be the best idea for prom, but a venue decked out like Oz can make for a gorgeous and unforgettable night. Take your attendees to a magical place that can only come from the Wizard of Oz event theme. Vibrant hues of green are a must for a recreation of the Emerald City. Welcome people to the city with a spectacular Emerald City Grand Entrance. Its towering castle doors will stop traffic and make for a perfect photo opportunity. It’s all about the atmosphere when it comes to creating the famous Emerald City. Take their breath away with the Emerald City Stairway Background. The illusion of stairs leading to the Wizard of Oz can be the focal point of your event. Perfect for pictures and hiding areas of your venue you don’t want seen, this 9-foot-3 tall and 14-feet wide background will make your Emerald City come to life! Anything goes in the home of the Wizard of Oz, which is what makes it such a special and magical place. Add your own personal touch to the place with different colored lanterns hanging from the ceiling. They can add romantic lighting to the venue and pops of color to the Emerald City. Not everything was green in Oz, so don’t be afraid to step away from your core color. Another way to add color is on the tables. Gold goes beautifully with green. Cover tables in white, but add sparkles of green and gold confetti for added flare. Don’t forget the importance of ruby red- the color of Dorothy’s famous slippers. Make your food and beverage tables stand out by covering them in a red glitter taffeta fabric. No one will miss the location of the refreshments with a beautiful table covering that will sparkle just like Dorothy’s unforgettable shoes. Just because the music may be modern, doesn’t mean the dance floor has to take away from the Wizard of Oz theme. Designate your dance space by surrounding it with the very road that led Dorothy to the Emerald City- the yellow brick road. Use the yellow brick road walkway to surround the dance floor. The bright yellow will attract attendees to the best part of the event- the dancing. Remember your favorite part of the Wizard of Oz? Make it a part of your event! Whether it was the yellow brick road, the rainbow Dorothy sang about, or even the beautiful poppies that put Dorothy and her friends to sleep, you can make it a part of your Wizard of Oz themed party. Go all out and purchase an entire Wizard of Oz Kit, and you’ll have an Emerald City that would make the Wizard himself proud! Draw romantic inspiration for a spring dance from a palette of pastels, soft lighting and exotic locales. “Exit” a carriage and enter a dream world of blue-and-white accented with gold. Featuring a fairy-tale castle almost 15’ high, wide sweeping staircases and lighted gossamer windows, Dream Come True is a true show-stopper. A combination of clever backdrop and free-standing pieces give the illusion of a luxury cruise liner visiting an island far, far away. Paris’ nickname is “City of Light.” This kit pays homage to it with an illuminated Eiffel Tower, light-able columns and LED light curtains. Light and place the big tunnel for maximum dramatic impact, and choose the colors of fabric slips for the modern luminescent colums. Trellis pieces on large columns create a garden reminiscent of ancient Greece. Festoon them with leaf garland or an ivy-patterned gossamer and see how beautifully they fill a large dance space. Add a few strings of twinkle lights to the huge tunnel and staircase. Nobody will be able to take their eyes off of it, and you’ll have built the perfect grand entrance, focal point and photo setting in one. Celebrate The Return Of Spring! Say good-bye to the cold and celebrate the return of spring with a retro flair. As color surfaces through the snow, create a space for releasing pent-up energy that is bursting with the colors of spring. Make it a night to remember that is full of activities and contests, prizes and favors, snacking and dancing. Fill neon prom balloons with helium for bouquets and with air to float around the floor. Hang three metal gossamer hanger with lights near each other at different lengths for interest. Drape some gossamer from hanger to hanger and some gossamer from the hanger to the floor for drama. If you prefer, position the three hangers over the different stations and drape the gossamer to the floor. Integrate color by hanging gossamer of different colors. We suggest pink gossamer, light blue gossamer, flame retardant yellow gossamer and purple gossamer. Cover unsightly walls with retro daisy patterned gossamer to present a flower and retro motif. One panel of this retro gossamer could also be added into the gossamer canopy created with the hangers. Make a stage area underneath one of the gossamer hangers for the DJ and final contest rounds. Cover the stage floor with yellow floral sheeting. Set off the different station areas by covering the floor of each station with more floral sheeting. Color options include white floral sheeting, purple floral sheeting and/or light blue floral sheeting. Welcome the guests at the main entrance with a set of retro standing cardboard daisies. This set comes with 6 daisies (2 per stand) measuring 6′ high. Drape more retro gossamer behind these daisies and around the base. One daisies set could be used as a prop for candid photos shot by the guests themselves. Make a welcome sign with solid color flat paper decorating material in your choice of color. Use flat paper to make activity signs for each of your contest stations. For the snack area, decorate the serving table and the conversation tables with the different solid colored gossamers draped from the ceiling hangers. Drape the retro gossamer around the edges of the tables. If the serving table is long and rectangular then use the retro gossamer as a runner. Accent the tabletops with mini flower fans. Cover the chair backs with more gossamer tied on with the retro gossamer. Mini flower fans can be stuck into the retro gossamer sash to add interest. For the centerpiece, fill clear crystal latex balloons with helium and retro confetti strung with various colors of ribbon tied to balloon weights. Choose event tableware in an array of spring colors to continue the fun spring color scheme. Include a “decorate it yourself” cupcake area with a variety of cupcake flavors, frosting colors and sprinkles. CAKE-CHAIRS – Invite guests to bring cakes that will be used as prizes for “cake-chairs.” Set out chairs decorated “a la snack area” to be used for this version of musical chairs. Give each round’s winner a create-a-ticket as proof of eligibility for the final cake-chair to be done at the end of the evening on the stage. The tickets can also serve as coupons toward a business sponsoring the event. For the final cake-chair round, the ultimate winner gets to be the first to choose from one of the donated cakes. The runner-up chooses next and so forth until the cakes are gone. Unlike the question/answer pattern, this game does the reverse. Give answers related to flower themed categories and challenge contestants to create a corresponding question. The winner of each round receives a qualifying ticket for the ultimate Flower A/Q round played on the stage at the end of the evening. Stumps Party has a huge selection of favors from which you can choose to be given as prizes. Think of frames, mugs, frames, pillows, mint tins, money clips and more.